What Is an SRF File? There are several file formats that use the SRF file extension, but the most common one is as a Sony Raw Image file. These kinds of SRF files are uncompressed and unaltered, raw image files that Sony digital cameras store photos in, similar to ARW and SR2 files. The animation software LightWave 3D uses SRF files, not for photos like Sony cameras, but to store information on how a 3D surface should appear, such as the color, transparency, and shading. These are called LightWave Surface files. Another use for a file with the .SRF file extension may be with Microsoft's Visual Studio software as a Server Response file (also known as a Stencil). Files in this format are used by .NET applications and may store script tags and HTML content. Yet another format that your SRF file may be in, if none of the above, is a Surfer Project file used with Golden Software's Surfer application. It might instead be associated with Samsung "smart" TVs, saved as a Steinberg Resource file, or used to store a collection of vehicle images used by Garmin GPS systems to express a 3D perspective of the vehicle on the device. Given the variety of applications that use SRF files, it's important to have some sort of idea what format your SRF file is in before you try to open it. As state above, most SRF files are Sony Raw Image files, so if you've gotten your SRF file from a Sony camera or you know for sure that it's that type of picture file, you can open it with Able RAWer, Adobe Photoshop, PhotoPhilia, or ColorStrokes. I'm sure some other popular photo and graphics tools will work as well. If the SRF file is used with LightWave 3D, then that's the program you should have to open the file. The options this format stores are the ones found in LightWave 3D's Surface Editor window, so that may also be how you open the SRF file. Use Microsoft's Visual Studio software to open the SRF file if it's in the Server Response file format. It should be clear to know the file is a Server Response file because they are just plain text files, meaning you can also open them in a free text editor like Windows Notepad, or even in a web browser (e.g. Firefox, Internet Explorer, Chrome, etc.). Is your SRF file is a Surfer Project file? The Golden Software Surfer program can open those types of SRF files. Surfer Project files that were created in an older version of the software can be opened in the newer versions, but not vice versa - the SRF files are forward compatible but not backward compatible. Steinberg Resource files are used with Steinberg's Cubase application to change the way that the interface and plug-ins look. While the Cubase program itself is used to work with audio files, the SRF file format is just an archive of images. SRF files that you suspect are vehicle images used with Garmin GPS systems can be "installed" to the device by copying the files over to it. You can do this by transferring the SRF files into the /Garmin/Vehicle/ folder of the GPS device. If you aren't sure if the SRF file is in this format, open it with Notepad++ - the first word should say GARMIN. I don't have any information on using SRF files from a Samsung TV except that they're either encrypted video files or a type of firmware for the TV. Keep reading through the next section below for a possible way of converting the video file to a different format. Because of the way some of these programs work, you most likely have to use the application's File menu (or something similar) to open the SRF file instead of just double-clicking on it. If none of these programs seem to open your SRF file, check that you're not misreading the file extension. SRT and SWF files, for instance, have a very similar extension but have nothing at all to do with any of these formats, and therefore open with different programs. If you find that an application on your PC does try to open the SRF file but it's the wrong application or if you would rather have another installed program open SRF files you can change the default program for a specific file extension. Though only the trial is free to use, the software called Ivan Image Converter can convert Sony Raw Image files to formats like TGA, PNG, RAW, JPG, and PSD. It's doubtful that LightWave Surface files can be saved to any other format because they're closely related to the LightWave 3D software only, and so would be pointless to exist in any other format. However, if you can convert one, it's most likely possible through a File or Export menu in the LightWave 3D program. Visual Studio's Server Response files are just plain text, so while you can convert them to any other text-based format (e.g. TXT, HTML, etc.) with most text editors, doing so would render the file useless by the .NET application. If you want to convert your Garmin SRF vehicle file to a PNG image in order to see what the vehicle pictures look like, you can use this online converter from "nuvi utilities". Just upload the SRF file to that site and then select the Convert it! button to have it converted to PNG. The result is a wide image of 36 different perspectives of the vehicle that the GPS device can use together as a 360 degrees view of the vehicle. SRF files may be a form of an encrypted video file that has been saved to a Samsung TV. If so, you might find useful this tutorial at IvoNet.nl for converting the SRF file to an MKV video file. Once in the MKV format, you might consider using a free video converter if you want the SRF file to ultimately be saved as an MP4 or AVI video. As for any other format that uses the SRF file extension, the same concept applies as it does with LightWave Surface files -- the software that opens it is more than likely able to convert the file, but if not, it's likely that the files really shouldn't be in any other format than the one it's currently in. What's a DRF File and How Do You Open One? What's a GRD File and How Do You Open One? What's a RAF File and How Do You Open One? What's an ASAX File and How Do You Open One? What's an AVE File and How Do You Open One? What's an ATOMSVC File and How Do You Open One? What's a DNG File and How Do You Open One? What's a WPD File and How Do You Open One? 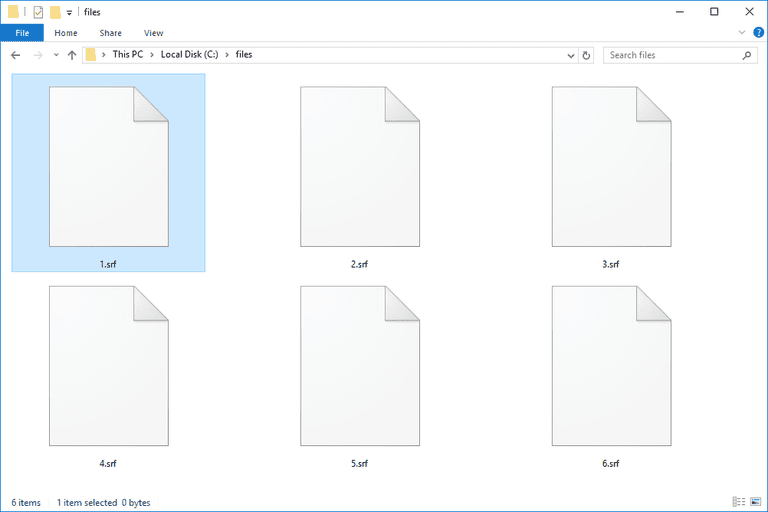 What's an HTC File and How Do You Open One? What's an APPLICATION File and How Do You Open One?